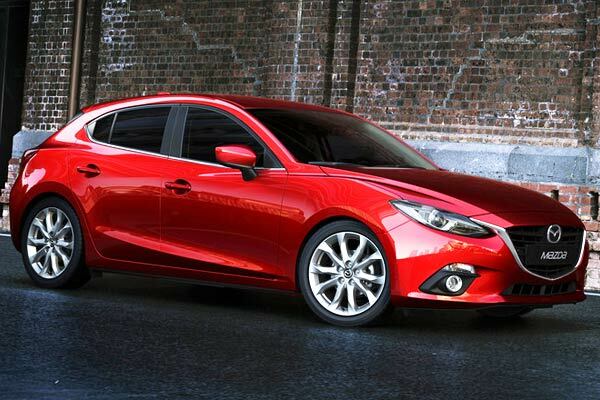 NEW MAZDA3 2014. Considered by critics of the automotive industry as the new benchmark in the segment of compact cars. MAZDA3 2014 SEDAN. The sedan version is simply wonderful, elegant, imposing and ultra-modern. Priced for under $17000 only, I dare to say that this Mazda3 is the most beautiful sedan you can get for the money right now in the country. The compact of the Japanese firm has benefited from all the development and technology that have been used in the CX-5 and Mazda6 models, which are known as SKYACTIV. However, it does not end there. The interior preserves the quality of materials and assembly, but is much more purposive and modern than the other Mazda products mentioned above. I should also say that were added some unpublished technological elements for the segment, that place the Mazda3 in similar levels to the premium brands. The 2014 Mazda3 is the most important product of the brand, not only in the U.S. but worldwide, and Mazda engineers have worked to improve it in every way, so much so that has been enough to make it the best compact in the market. It comes equipped with the new SKYACTIV-G engine with direct injection and high compression of 2.5 liter that delivers 184-hp and 185 lb-ft of torque, attached to a six-speed SKYACTIV-D transmission with manual mode and paddle shifters behind the steering wheel. OUTSTANDING EXTERIOR DESIGN. It now incorporates the automaker's latest Kodo styling language. Kodo is Japanese for "Soul of Motion". The wheelbase has grown by 60 mm compared to its predecessor, although the overall length of the vehicle is 4,460 mm, in other words, 45 mm shorter. It is also lower by 15 mm with a height of 1,455 mm, while the width is 1,795 mm. Although the proportions may transmit the opposite, the Mazda3 2014 provides more space for legs, hips and shoulders than the previous generation. MAZDA3 2014 IN MOTION. Its amazing fuel-efficient rating, premium amenities and safety features, make it a more seductive alternative than similar cars like the Ford Focus, Chevy Cruze, Hyundai Elantra, Honda Civic, Kia Forte or the Toyota Corolla. In terms of safety features: six airbags, ABS (anti-lock braking system), DSC stability control, TCS traction control, EBD (electronic brakeforce distribution), Bi-Xenon headlights, reverse camera and rain sensing wipers. At the interior of the car, is where the Mazda3 takes the lead with respect to its direct competitors and even points to the premium compact segment without any problem. The quality of materials and assembly, in conjunction with an extremely well made design make the cabin of this renewed compact of the Hiroshima firm, a very nice space. INTERIOR. 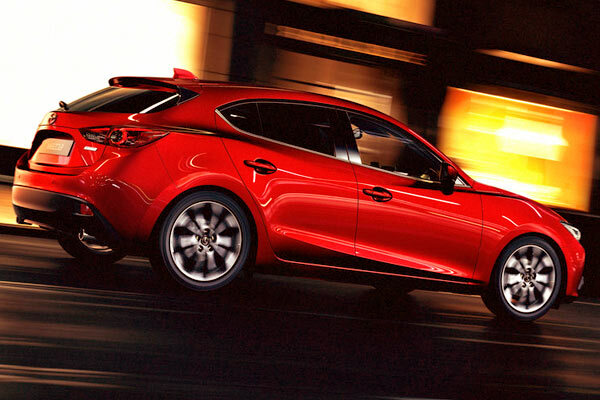 The Mazda3 is best-selling model in the entire Mazda lineup. 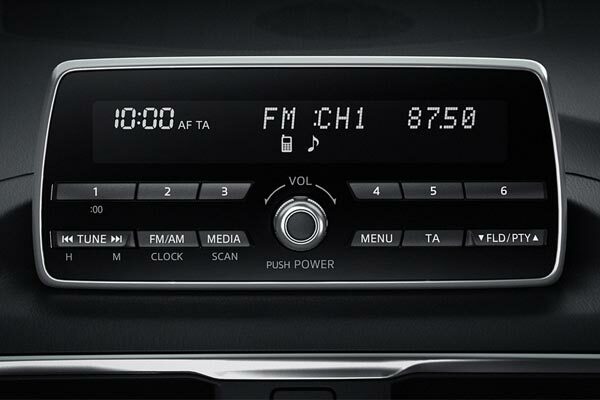 At the top of the dashboard is located the high resolution screen where you can see the information of the trip computer, the GPS or navigator, which is sold separately, and also audio system functions, which in the case of the top model of the range, is signed by Bose and includes 9 speakers. The phone that uses Bluetooth interface reminds me to the system of BMW's. FRONT SEATS VIEW. 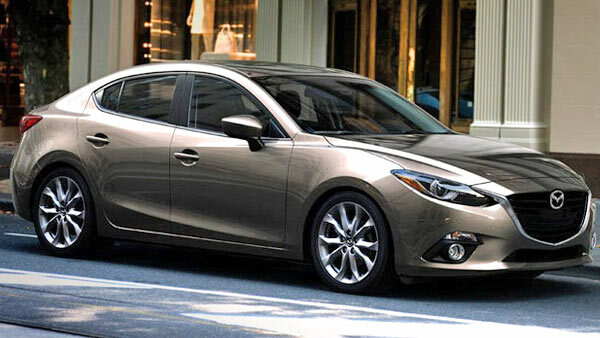 The stylish of the Mazda3 sedan sedan shares much visual DNA with the larger Mazda6. The same case applies to the control named HMI (Human-Machine Interface) which is located on the center console. 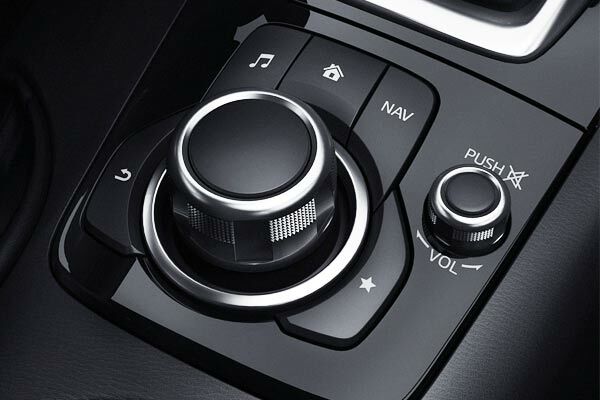 This one is a circular knob that allows you to navigate with ease through the different menus that are displayed on the screen, again, much like the iDrive of BMW which, the MMI of Audi or the Comand, the Navigation control system of Mercedes-Benz. The decision of the Japanese firm, of using design, controls and electronic instrument clusters, similar to those that we see in vehicles of luxury brands, should not be seen for any reason as a bad thing. INSTRUMENT CONTROLS. 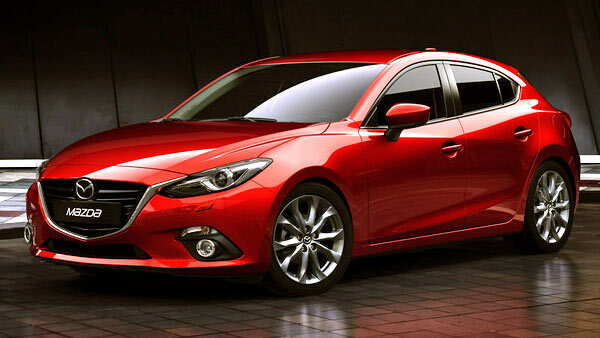 Better quality materials, improved finishes and more user-friendly control layouts are part of the redesigned Mazda3 2014. Instead, this Mazda3 2014 is bringing to the compact segment, materials, technologies and solutions, until very recently reserved only for vehicles located at a much higher price scale. If we make an analogy, it would be like criticizing a girl for having a physical resemblance to Scarlett Johansson. Above the cluster of instruments, which is dominated by a large analog tachometer located in the center, is deployed a retractable head-up display that shows the speed at which you are moving, and again, if the car is equipped with navigator, the instructions of the route to follow that the system is giving you, are shown here too. INTERIOR AERIAL OVERVIEW. 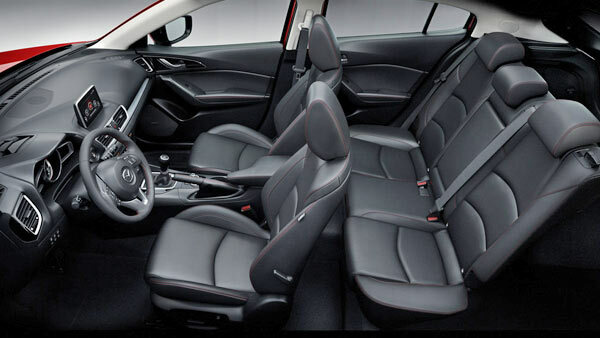 I have to admit that if you want a little more space in the rear seat, you should take a look at the Nissan Sentra, Toyota Corolla or Volkswagen Jetta, which are more spacious in this side of the car. Somehow, from the driver's position, the Mazda3 is a bit like a fighter plane. Obviously they could not miss items such as: audio controls and cruise control mounted on the steering wheel, power mirrors and door locks, sunroof, dual zone automatic air conditioning, power driver's seat, keyless entry and ignition system, and leather seats. 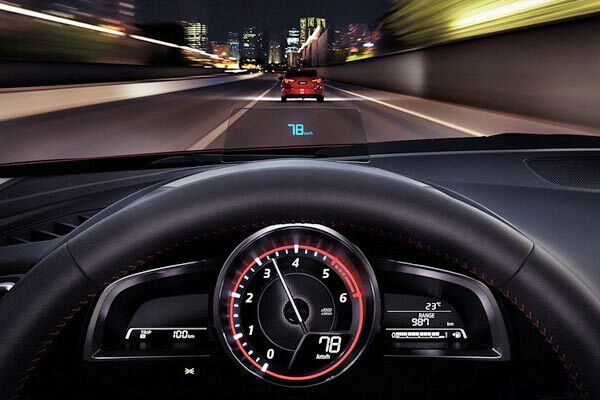 Behind the wheel, the 2014 Mazda3 meets the expectations generated by its attractive exterior and interior. The noise filtering system works very well, which added to the amenities that it offers and its smooth running, I find that this is a very comfortable and well made product. BEHIND THE WHEEL. This sporty car drives as wonderful as it looks. This new 2014 model introduces new technology and safety features that any of its segment rivals would also like to offer to its drivers. When driving in the city, you can speed up perfectly in a range of no more than 2000 rpm, without ever feel that the car lacks power. Although it is extremely difficult to explain, the SKYACTIV technology (chassis, engine and transmission) is really a tremendous technological progress that makes the Mazda3 the most advanced car of its segment and the market, and seriously, it is virtually impossible that in the modern automotive industry, a manufacturer develops from zero, all components of a vehicle as it was in this case. DASHBOARD &am; CENTER CONSOLE The head-up Active Driving Display and the high-mounted touch screen, are some of its coolest features. This simply translates into a car 220 pounds lighter than its predecessor, but that meets the strictest standards in terms of impacts and occupant protection. It has a motor that is much more efficient than before but 21 hp more powerful. And finally, it comes with an automatic transmission that incorporates some unique developments to provide the operating speed of dual clutch gearboxes, but without the drawbacks that they have when working at low speeds. When you push the accelerator to the floor, you are going to find with a product that does not leave for a moment its philosophy of fun, called by the firm as Zoom - Zoom. HIGH MOUNTED TOUCH SCREEN DISPLAY. The engine increase its rpm easily and quickly, and when you press the little Sport button that is located next to the shifter, the transmission, which normally takes care of gas consumption, holds the shifts as much as necessary, approaching without fear to the tachometer red zone. The steering wheel is quick and accurate. Furthermore, the shift paddles located behind the wheel, always provide an extra when you want to use the sporty handling. The Mazda3 2014 is available in two different models, the 5-door or hatchback, which starts at $18.945, and the 4-door sedan, which starts at only $16,495. The hatchback model has a fuel efficiency of up to 40 MPG, while the sedan delivers up to 41 MPG for the 2.0L of 155-HP engine version. Well, you already know that for this coming year 2014, for less than $17000 dollars you can buy brand new, one of the most beautiful, complete and cutting-edge cars ever built in the industry. It's totally worth a test drive.